Babingtonite crystal (with green prehnite) from Lane & Sons Traprock quarries, Westfield, Hampden County, Massachusetts; photo by Didier Descouens on Wiikipedia (use permitted with attribution / share alike). Although Massachusetts is not rich in mineral resources, it's one of the few locations in the world where babingtonite is found. 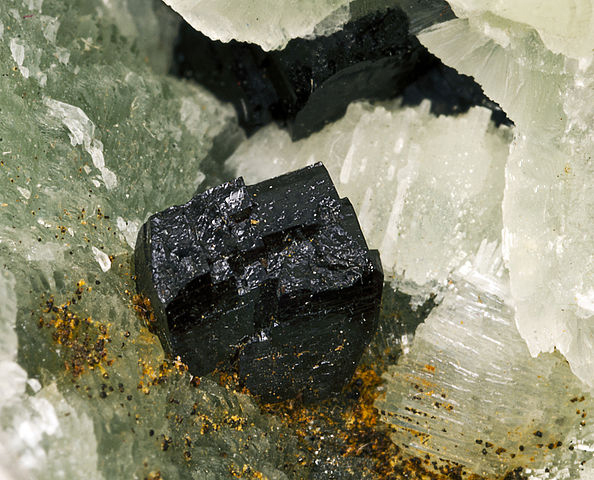 Babingtonite is usually jet black with a brilliant luster. 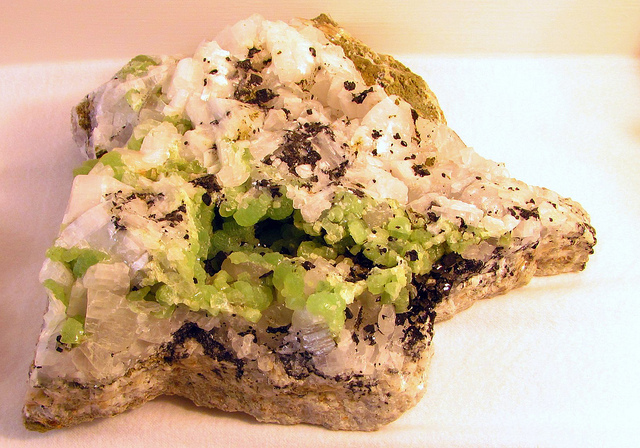 Massachusetts babingtonite ore (with green prehnite and white calcite) from Lane Traprock quarry, Westfield, Hampden County, Massachusetts; photo by Rhiannon Boyle on Flickr (noncommercial use permitted with attribution / no derivative works).